1. 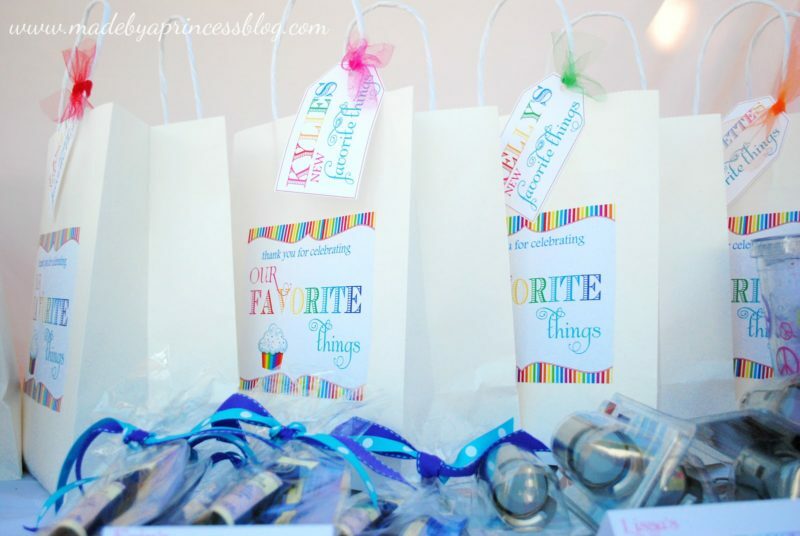 Each person brings 5 of their favorite things (costing $6 or less) and they can be all of the same or 5 different thing. 2. Bring your favorite dish. It can be a dessert, appetizer, entree, whatever you like. I did not tell anyone why I needed their favorite songs, color, or quote – they would just have to wait and see! I wrestled with the theme for quite awhile. 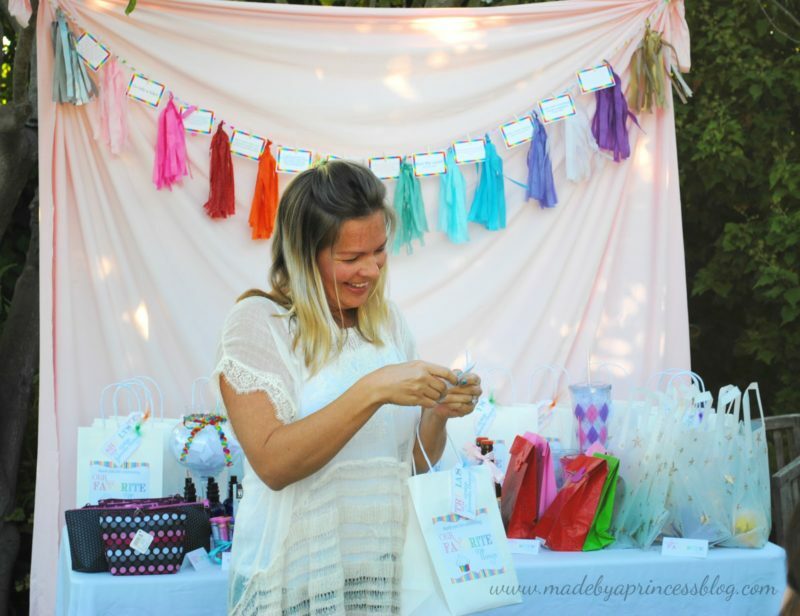 I was so tempted to go with my signature color, pink, but ultimately changed direction because it wasn’t a party about my favorite things, it was about celebrating our favorite things. 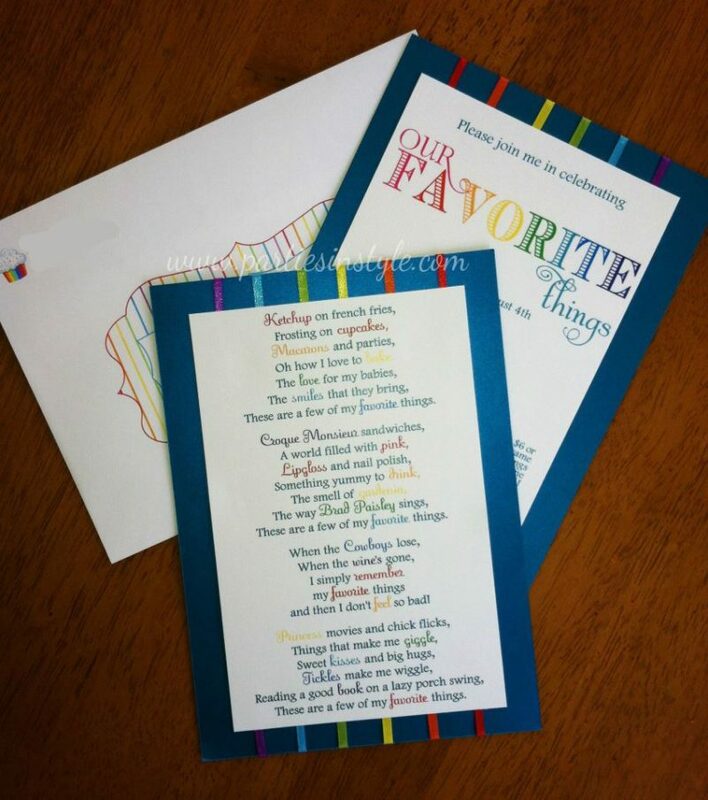 I went with “rainbow” as a theme to encompass a wide range of favorite colors. I played around with a lot of different invitations designs and none of them were really speaking to me. I used to write poetry so one night when I couldn’t sleep I started writing down my own version of the “Favorite Things” song from Sound of Music. When I was done I realized I had exactly what I wanted for the front of the invitation. 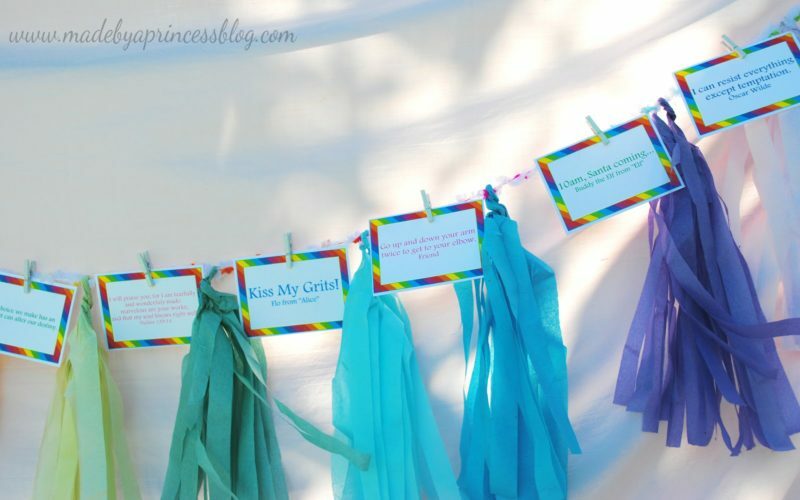 The poem was on the front and the party info on the back with ribbon in rainbow colors to tie it all together. So invitation is done. Now what? Well, decorations of course! 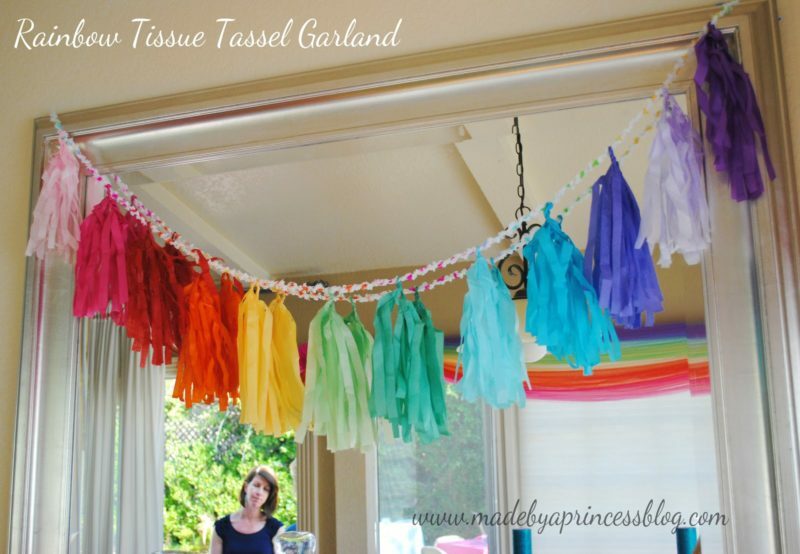 I had seen a number of tissue paper garlands and thought those would work well with the feel of the party. I knew these would take awhile so I gathered my stacks of tissue, a pair of new scissors, a ruler, and a glass of wine while watching the Olympic Opening Ceremony with the family and cut for the next few hours. 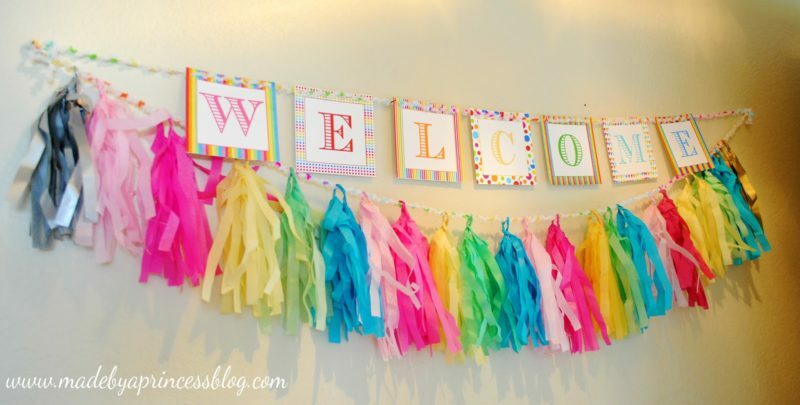 This welcome banner and garland was hanging in my entryway. I like to have a welcome sign on the door to set the mood for the party and let my guests know right away how excited I am for them to be there. 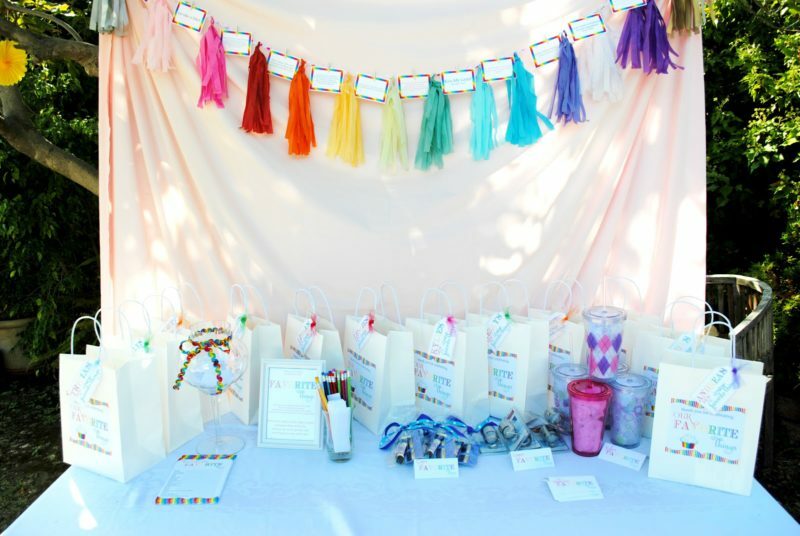 I had tassels hanging all over the house and backyard which looked to colorful and bright. I just loved it! 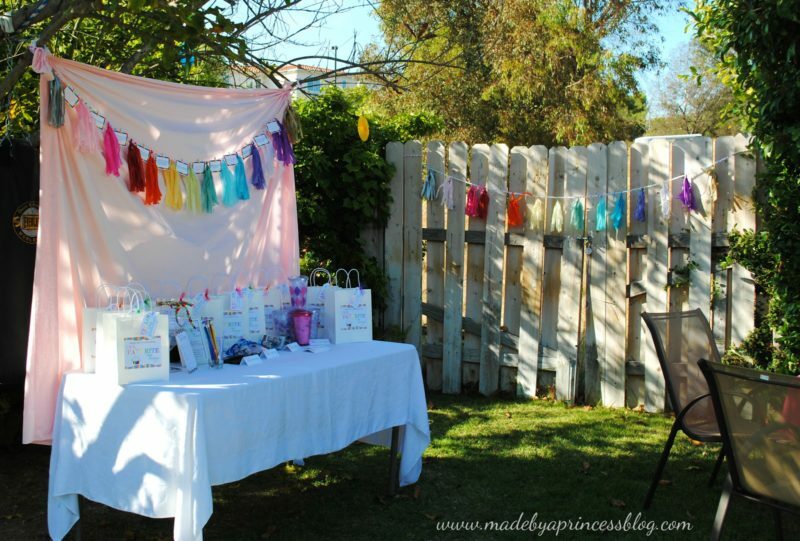 I used tulle to create a rainbow window treatment and rainbow honeycomb balls in the corners to tie them together. 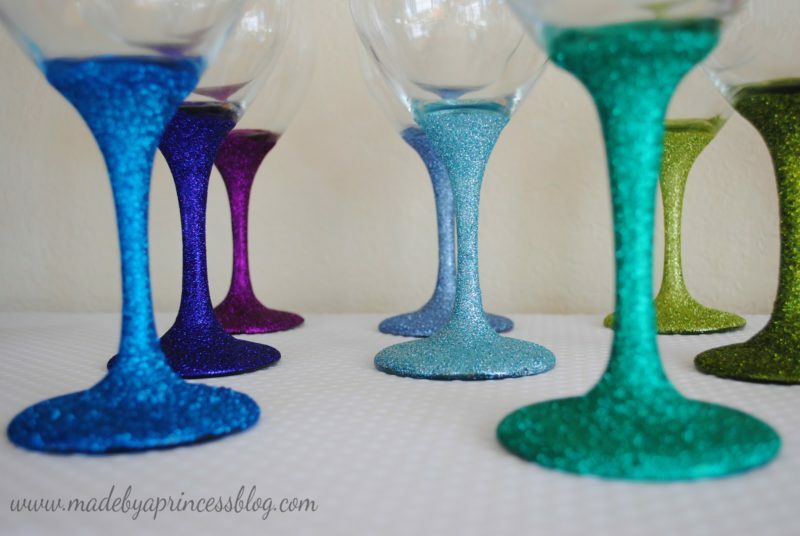 Weeks before the party I made glittered wine glasses for every party guest. I bought the glasses at my local Dollar Tree and Modge Podge, Martha Stewart glitter, and clear spray sealer at Michael’s. I did try another brand of glitter before using Martha’s and it was not nearly as good. Like not even close. Martha’s colors are vibrant and bold and very sparkly. I probably used about a 1/4 bottle of glitter on each glass. The one thing I will say about using the sealer is that it is NOT waterproof. Next time I would either seal with Modge Podge instead of the spray or find something more water resistant. It was a pretty big bummer when I went to wash the glasses out and the glitter started to melt away. I did not submerse the glasses either, just a little water trickled down and it started coming off. For the amount of time it took I wish I had tested one out before so I knew better than to just use spray. Other than that, this project was a huge success and will definitely do again. My friends loved their glasses and by doing each one in a different color they could easily keep track of their wine. So decorations are done…now on to the menu. Since each person was bringing something to share I didn’t have to do a whole lot of cooking for this party but I did make date rumaki (of course! ), mini croque monsieur sandwiches, and rum cake. My friends brought so many wonderful things to share and I didn’t get a single picture of any of it! I was so busy catching up that I completely neglected my photography duties. I used a pink sheet that I had left over from my daughter’s first birthday (Sugarella’s Sweet Shoppe Cupcake First Birthday Party) as a backdrop for the favorite things table. Each guest had their own place card so when a name was drawn we could easily figure out who brought what. This picture was taken before most of my friends arrived and sadly, I never got a picture of the whole table! 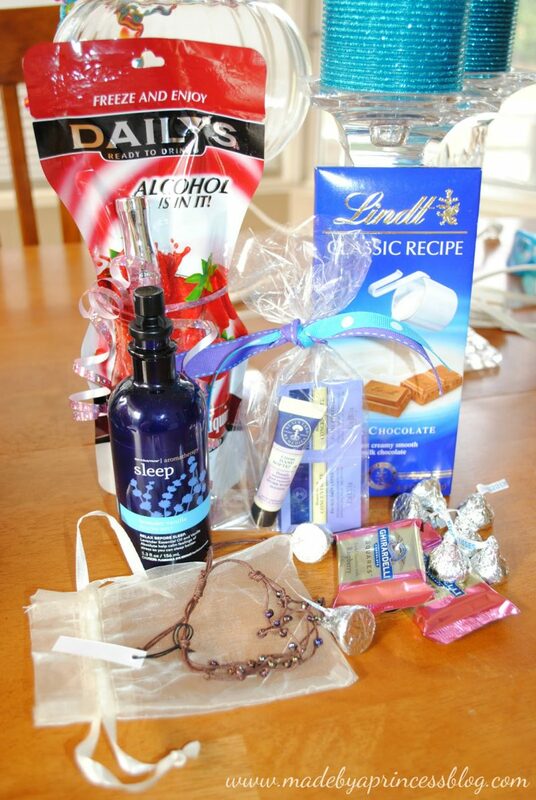 Note to self for next party – get a picture of all of the loot! There were so many fabulous items and new favorite things. I gave those insulated cups in the background because I love drinking water and always have one with me. Next to my cups are my mom’s champagne stoppers. Those are great! Somehow though in my house the champagne just disappears and I am left with an empty bottle… Next to my mom’s favorite thing are packets of NYR Organic samples from my long time friend, Erin. Erin didn’t read directions and ended up bringing samples for everybody! That was a big hit for sure. 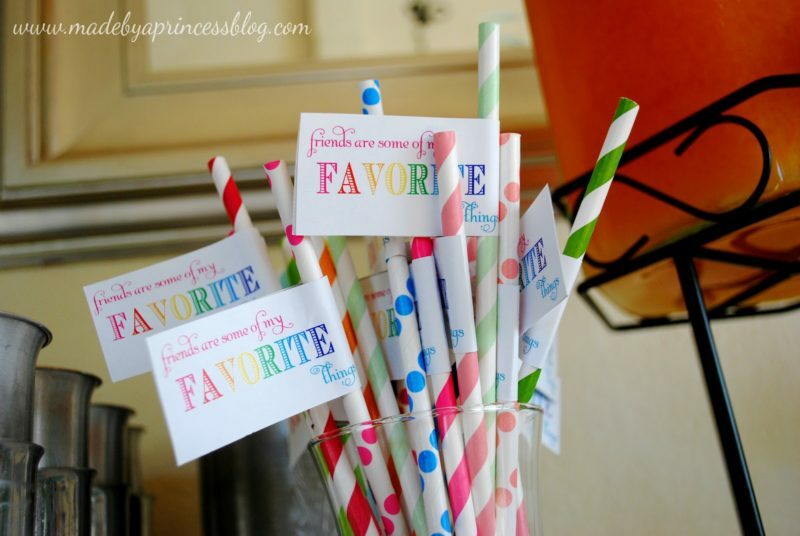 Some fun straws I bought from Crafts by Jilly. I know I didn’t *need* the drink flags but I just had to! This is my little cupcake, Megan, also known as Sugarella. 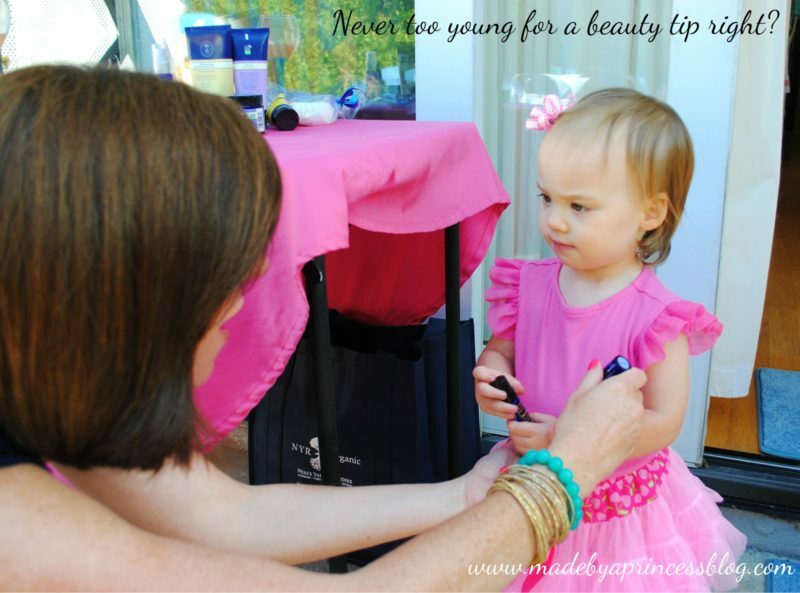 She was ready to party with the girls and get her pampering on! This is my friend Erin. We have been friends for more than 25 years (yes, that’s right 25!) and she unfortunately lives in North California now. 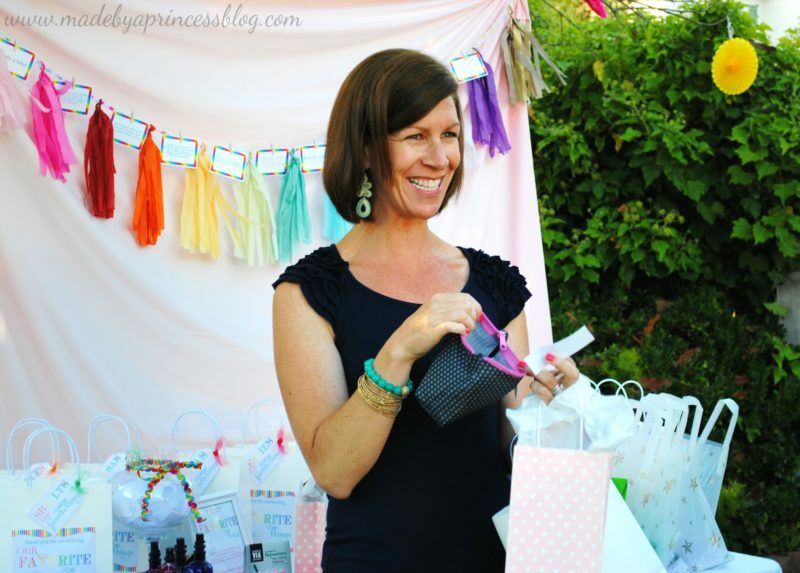 When she told me she was going to be in San Diego in August I knew I had to plan my party around her visit because a) I wanted to see her and b) I wanted her to introduce my other friends to NYR Organic. I have been using the products for awhile and LOVE them. Since we were talking favorite things she brought 10 of her fave products. As you can see my little one wanted in on the action too. This mama is going to be in trouble in a few years. If any of my stuff goes missing I know right where to look. 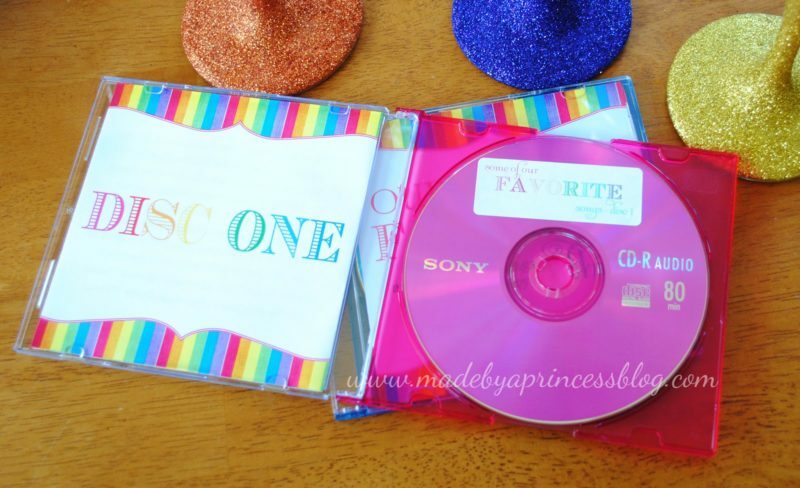 I made everyone a CD set to take home with two of everyone’s favorite songs. Songs I didn’t have, which were most, I purchased on iTunes. I purchased colored CDs from Amazon because, well, colored CDs are just more fun. This was a two disc set because there were so many songs. I made little cards out of each our quotes and used our favorite colors for the text. I told the girls not to tell anyone which quote was their own though. Whoever was up choosing their favorite things gift from the table had to find a quote and read it to the group. That person was then next. It continued until all the quotes were read and gifts were gone. These are some of my lovely friends. Again, I wish I had taken more photos! Before we chose a name from the jar (so we could choose a gift) everyone read five things from their favorite things list. It was really neat learning things about each other, things that you should just know about a good girlfriend but never asked. This is one of my bestest BFFs, Trish. If you are a fan on Facebook you have heard me talk about her a lot. She is my creative right hand girl and a wonderful photographer. This is Erin, my friend for more than 25 years. Erin has four kids. Seriously. Four. You would never know it! This is Andy. She is a kick. She loves to hike. I mean really loves to hike. We don’t share that interest (like at all) but we do love to party and have a glass of wine or two. This is Kelly. 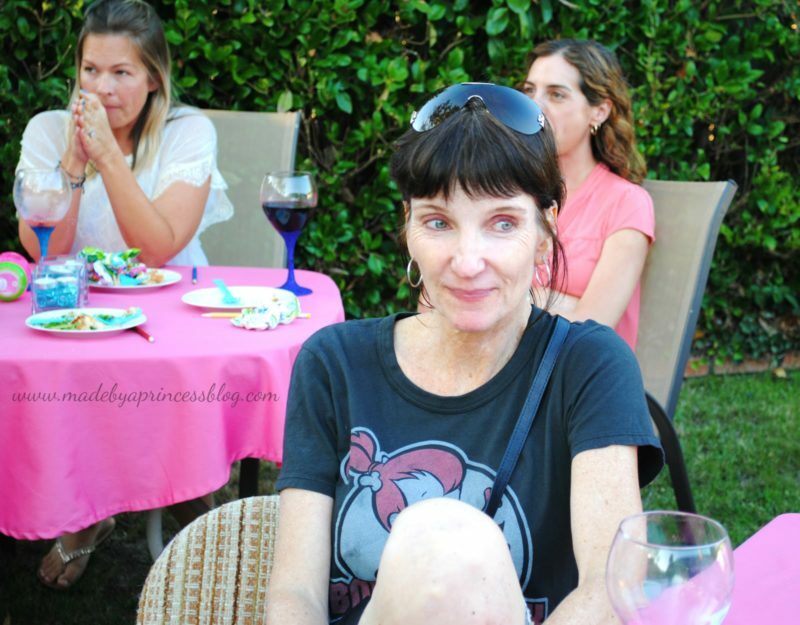 One of the things I love most about Kelly is that she is so real. You don’t get any BS with her, you know where you stand, and she always makes me laugh. This is what was in my bag..
Don’t I have the best friends?! We had so much fun that my mom has now insisted (I say that with a smile) that we have a Favorite Things Holiday Edition. I have already sent an email to my girlfriends letting them know to get their holiday fave things together because we’re doin’ it again! 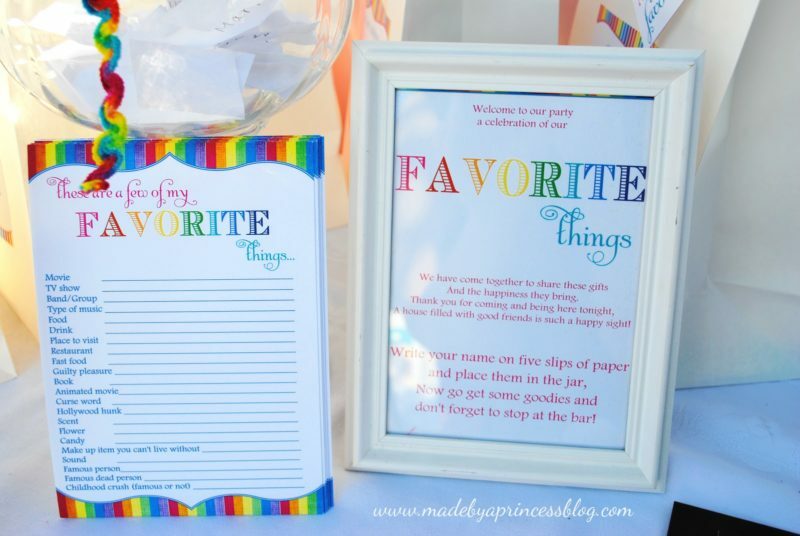 Grab your girlfriends and host a Favorite Things Party – you won’t regret it! This is too cute! I am going to have to try this sometime! 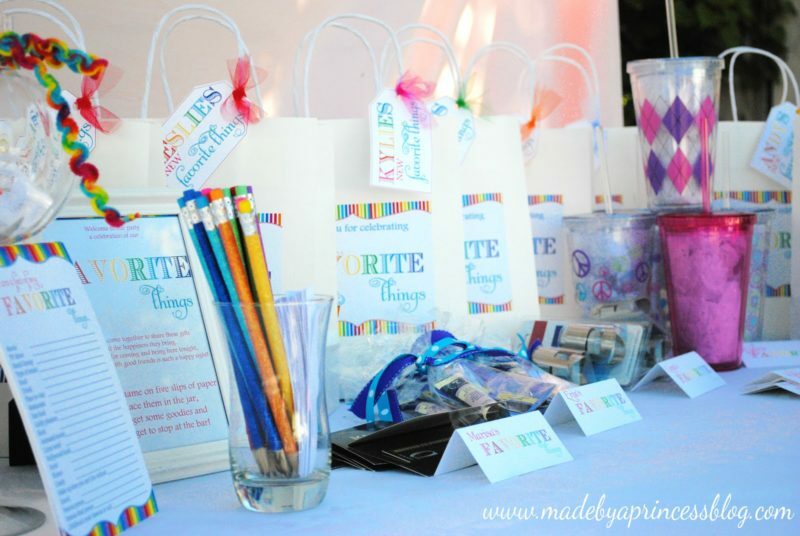 Kylie, I really love this party and it is an honor to feature it on my blog! It is fabulous! Thank you so much Lydia! 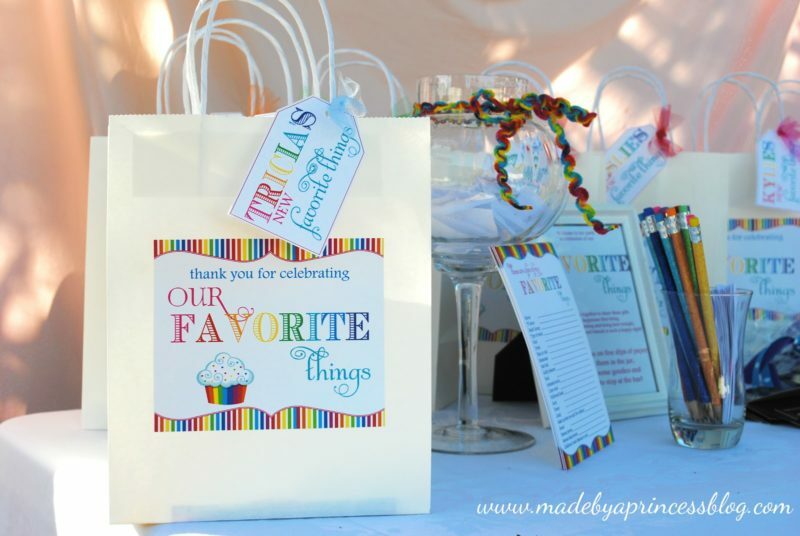 I am so honored you have chosen to feature my party! 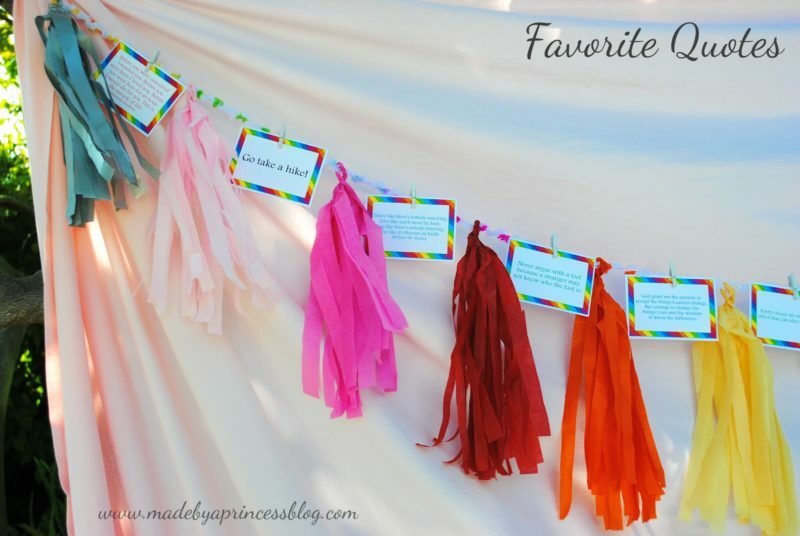 I would love to do something like this for a women’s day retreat I’m planning. I’m just curious about the logistics of it. How many women participated? 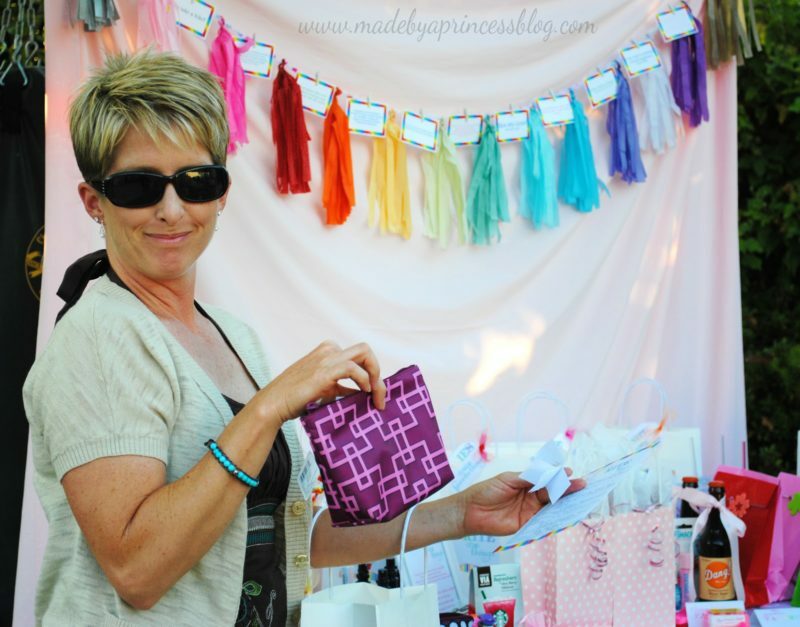 Every woman brought 5 things & walked away with 5 things… how did you figure out who would get what? Such a great idea!! Thanks for sharing! Hi! There were 15 of us and each person brought five things. I had the ladies put their name on 5 slips of paper and put it in the jar. Each person chose 5 names from the jar and went home with whatever that person brought. You can’t choose your own name and all 5 names have to be different. 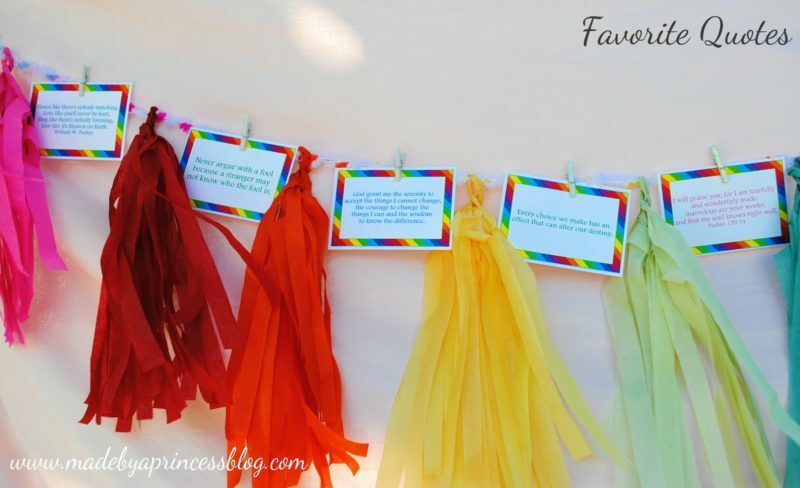 It is a lot of fun and I think it would be a great activity for your retreat!